Preheat the oven to 350°F. Place the iron skillet into the oven to heat. In a medium bowl, combine the flour, cornmeal, baking powder, and salt. Stir to mix. whisk until smooth. Using a rubber spatula, fold the dry ingredients into the wet ingredients in two batches. Add 2 Tablespoons butter to the hot iron skillet. Melt the remaining 6 Tablespoons butter and stir into the batter until smooth and uniform. Remove the hot iron skillet from the oven and pour in the batter. Bake for 35-40 minutes until browned and a toothpick comes out clean when inserted in the center of the cake. 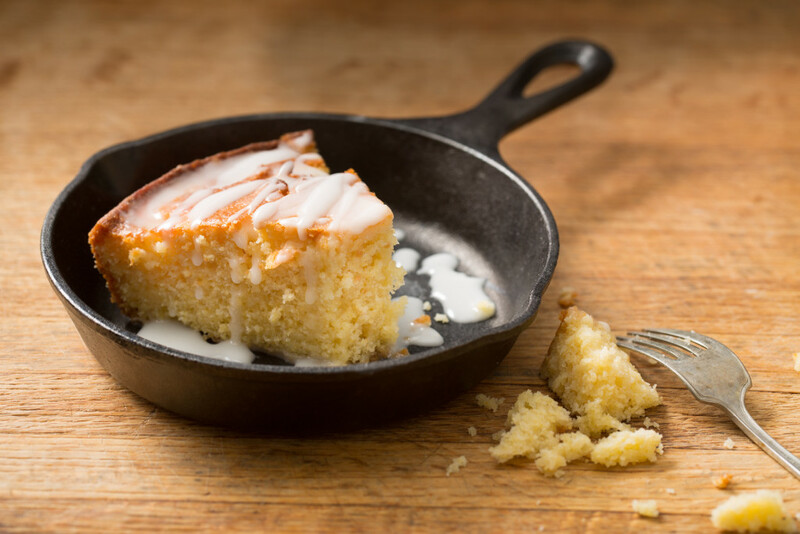 To make the syrup while the cake is baking, place the ½ cup lemonade in a small saucepan. Reduce over medium heat to ¼ cup. Remove from heat and set aside. While the cake is still warm, pour on the lemon syrup around the edges of the cake and in the center. You may have some syrup leftover. Allow the cake to cool.